With technology moving at a scorching pace, there are many new offerings that can give you the edge over your competitors. Read on to see how 4G LTE and NFC can help add value to your business. 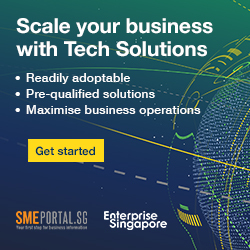 Technology can be the catalyst that enhances the running of your business - helping your workforce achieve greater efficiency, or improving the overall business’ IT framework. Here's a quick look at two prominent technologies that have been launched recently - 4G Long Term Evolution (LTE), and Near-Field Communications (NFC), and how they might be useful for your business. Greater mobility for your workforce - 4G will let your employees to get more done on the go. You can cut down on unnecessary trips back to the office and even use 4G devices to hold high definition video calls with clients or virtual teams. Back up devices on the go - The days of coming back into the office and backing up your device are well and truly over. With 4G, you can automatically back-up all your documents, images, settings and address books whenever and wherever you are. Give your marketing a boost - An effective way to market a small business is to create online videos. These videos are usually large in file size, so uploading them was a problem. With 4G, you can upload these videos to Facebook, YouTube or Twitter, improving your business’ online visibility and help capture the human element behind your company. Reduce wait-time for downloading data - Downloading an image-heavy attachment often takes too long. A 20MB document, for instance, will take on average of 8.2 seconds to download with 3G. Downloading the same attachment using 4G will reduce this wait to less than a second on average. Nurture a good work-life balance culture - The potential to work remotely can help increase your employees’ work-life balance, allowing them to avoid traffic or long commutes. Instant connectivity to your work network means that your staff will always have the access they need to crucial documents at a moment's notice. This can lead to an increase in productivity and a happier workforce. For more information regarding 4G LTE, you can visit this Singtel link to find out more. Supported at over 30,000 retail points, Near-Field Communication (NFC) is the technology that allows customers to use their mobile phones to make payments with a simple tap on the reader (much like the EZlink card/reader). Three different types of payments - credit, prepaid, and stored-value - will be made available for all NFC-enabled mobile phones. Reduce transaction times - Contactless payment systems cuts down on the time a customer needs to wait in line, and at the register. For businesses with limited staff on hand, this can be the difference between getting through a line quickly versus watching disgruntled customers leave before making a purchase to avoid long waits. Pre-loaded reward points - Having loading reward points cards and coupons on a customer's smartphone means less hassle digging out physical coupons at the register. This ensures that the customer still earns points for every transaction, while building brand loyalty through a rewards programs that is simple to use. Keeps you up-to-date with the latest in the technology - Depending on your business, customers will appreciate a store that embraces the latest in technology. For example, a store selling electronics or a computer repair shop can gain a good reputation of being a fast adopter of technology, leading to higher sales. Greatly increases potential customer base - As more and more retailers adopt NFC in their payment modes, businesses might find that potential customer might favour businesses that facilitate NFC-made payments. This is very much similar to the introduction of NETS, and how it picked up and eventually became available across most retail outlets across the country. Click here for more information on how Singtel and EZ-Link have partnered to launch NFC payment technology. Have you thought about implementing new technology into your business, or are you currently using 4G or NFC? Drop us a line in the comments box below and share your experiences.